So, um are these Pinterest worthy or what? I pin a buttload of baking-y recipes every week, and a few ideas for these babies have been sat there staring at me for a while now, willing me to give making them a go. At the moment I don't have a proper kitchen, and not being able to make cute little things like this, let alone full-on bake things has really been getting me down. So, when I went to visit my little sister recently, I went armed with a chock-a-block Pinterest baking board. Naturally. I've seen ombre strawberries a few times on the interwebs now, and they looked like they'd make a totally dreamy Instagram picture. They were fairly easy to make - not quite as easy as I had imagined though! But, in the end, I did get my Insta-worthy snaps, so it was all worth it! Method: 1.) Wash your strawbs (gotta be done) 2.) Split the white chocolate into 4 equal parts and melt. Place into 4 bowls. 3.) Keep one bowl food colouring free. Add 3 drops of food colouring to the second bowl, 6 to the third and nine to the final. 4.) 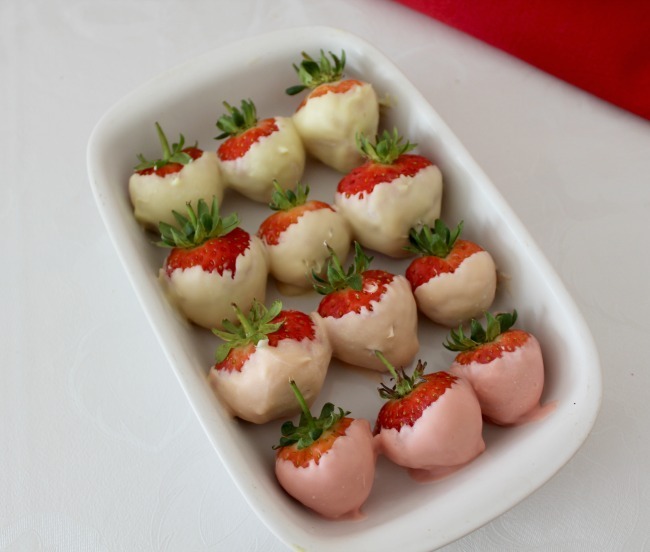 Swirl your strawberries in the mixtures, and place in whatever order you fancy! There we have it guys! Have you ever tried anything similar?